Our Blue Pool activity playmat encompasses many functions, making it our most versatile product ever. First it's an Activity Center with a 50cm inner pool diameter. Three toys are conveniently tucked in the inner ring. 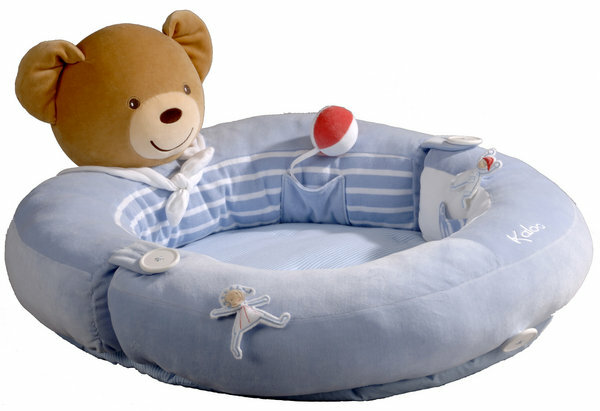 The bottom pad provides comfort and peace of mind while providing a secure environment for your new arrival. 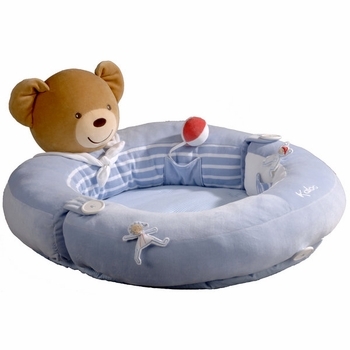 The front side detaches easily with its large safety buttons and magnets to become a comfortable Nursing Pillow (dimensions: 16 cm diameter x 90cm length). As always, most everything Kaloo is front load machine washable and dryable. With the front end off the Pool, it then converts to a playful Changing Station (dimensions: 72 cm x 63cm). In a final bit of cleverness, the pad can be completely detached (again via the Safety buttons and magnets) to become a Back Rest (dimensions: 40cm height), for years of regular use. All kaloo products are created with the greatest of care and attention under the supervision of quality engineers. These standards cover such aspects of safety as the strength of the stitching, non existence of prohibited chemicals and fire resistance. In addition to these safety standards the kaloo fabrics have some added qualities. These added qualities ensure the durability of the products. It is recommended that products be machine washed and tumble dried to conserve the colors and the quality. * All facial features are stitched in computer embroidery to ensure the longevity * of the products and avoid any detachment of the threads.